The East-West School of Music had its beginnings at Ananda Ashram in 1978 and flourished under the direction of Acharya Roop Verma. Inspired by Shri Brahmananda Sarasvati to fulfill the vision of East-West unity through the arts, the School is dedicated to promoting music as a medium to experience and express the relationship between outer sound vibration and inner being. Through this direct contact, deep states of healing, creativity and spiritual awareness arise, leading to better understanding of ourselves and the world around us. For many years, the East-West School of Music has been offering ongoing monthly classes in North Indian Vocal Music and Tabla. This has included regular classes in Instrumental Music, with particular focus on Sitar, in the master-pupil oral tradition at its best. 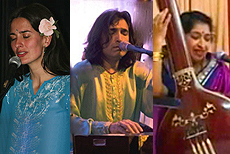 Special workshops and courses with Ashram and guest teachers are scheduled seasonally, providing instruction in both Eastern and Western music. 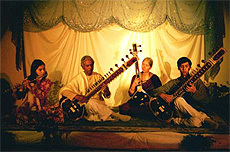 In addition, there are regular concerts featuring classical Indian music as well as music from other traditions. "The study of music brings one more in touch with the creative energies that sustain and nourish one's life." • Acharya Roop Verma left his body in March 2017. Please visit this special memorial page. Afternoon group classes for children. Please inquire about private instruction. Naren Budhakar teaches both the grammar and the practice of Tabla, which makes students understand the principles of the compositions instead of learning them merely mechanically. His teaching of proper finger techniques lays a foundation within weeks that will last for a lifetime, even for total beginners. Naren also teaches techniques for accompanying Kirtan, Bhajans and Light Classical Music. For scheduling please contact Naren directly at: naad2000@hotmail.com or 646.279.7199.